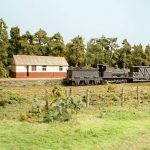 This may be of interest to modellers. 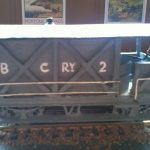 I have recently acquired name and number plates for my 7mm:ft model of Carlisle. They are in the catalogue of “Thatcher Plates” now sold by Narrow Planet. 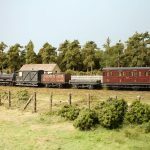 They were listed under Border Counties Railway – another BCR. The plates are very nicely etched. In fact the letters on the nameplate are probably rather crisper than the original! The plates are a little oversize, the etch measures just over 3 scale inches radially and I measured the original at 2.7. The number plate is also a little oversize but I think acceptable. 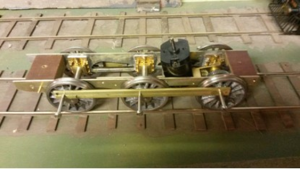 In the way of larger “new-builds” the frames have been rolled out (with dummy rods) – the real coupling rods are in manufacture. 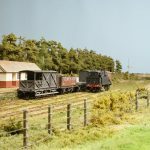 Albyn Austin has sent in the following that might be of interest modellers……. Shapeways, the 3D printing outfit, have on offer under railways the BCR Hull and Barnsley coach produced by a gentleman who trades as Recreation21. It is available in various scales but the 3D printing produces a slightly rough finish which may not be to everybody’s satisfaction. 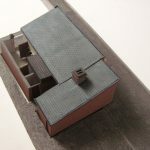 The cost is 52.53 Euros in 4mm, 1/76 scale as the model is printed in Holland. 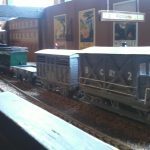 It comes without a floor or handrails etc but does have axle boxes. 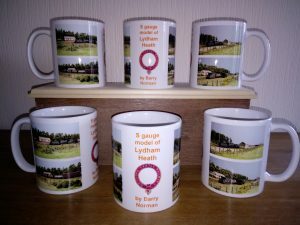 It might be of interest to members. The code is o-76-bc-hb-3-5-brk-3rd-coach. 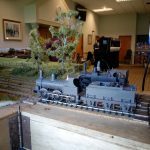 The s gauge layout was well received recently at the CADMRC model railway show at Ludlow Racecourse. In fact we had several requests to take it to other shows! 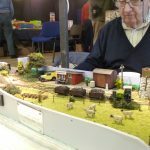 On this occasion we are grateful to David Hemsley BCRS member and Trevor Hughes, Jonathan David and Mark Wigley, all Newtown Model Railway Society members, for operating it throughout the day. If we are to continue showing it, we will need a team of enthusiastic people who will be willing to collect and transport it to the venue, set up, operate throughout the day, then take down and return it to storage in Craven Arms. Probably a minimum of four people but ideally five or six, two of which would need suitable transport i.e. a small van or estate car. 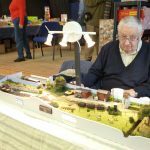 You don`t necessarily have to be a society member, just interested in model railways and willing to help out on a few days per year. It would be entirely up to the team to decide the distance they are prepared to travel and which shows they attend. the general public at this show. 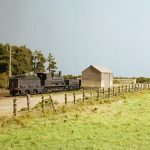 Whilst the society is still the owner of the Lydham Heath layout, following the closure of the museum it has been despatched into the care of Craven Arms Model Railway Circle. 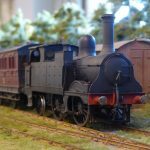 It is possible that it may be seen in operation at their next model railway show at Ludlow Racecourse on 5th May 2018. Confirmation will be announced nearer the time. 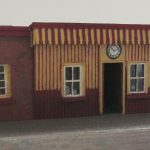 Roger Dalton has produced a plan of the weighbridge office in OO scale suitable for anyne modelling Bishop`s Castle Station. 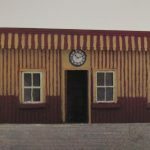 Albyn Austin has sent in photographs of his excellent model of Bishop`s Castle Station, showing rarely seen images of the right hand side and the back. 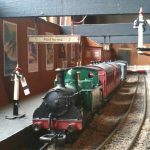 Nick Richardson a modeller from Portsmouth has sent in his interpretations of the BCR locos. I have a OO gauge model of Bishop’s Castle under construction. Track laid – but needs a point sorted out. 6 ft long plus a 4 ft fiddle yard. Progress glacial in recent times due to other things getting in the way. 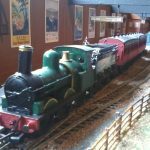 I have a SECR all third that is a pretty close replica of the ex H&B coach, in brown teak colour as it would have appeared if the overhaul had been completed. Also two old LNWR coaches that are nearly finished, a part built B&M coach, bits for an LSWR 6 wheeler, a nearly completed Carlisle, a No. 1 Tankie, a couple of vans, 4 cattle wagons that need lettering – transfers acquired, half built crane wagon and low sided wagon. 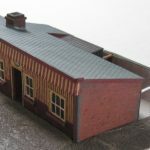 A van body for the coal yard, plus some sheds that need painting. Lots of bits for other things. 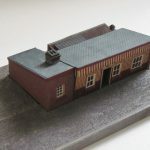 A kit for the Goods Shed, and plans and bits for station building. Lot more to do!